A Ciderist Writes: It's pruning time! Well, here we are again, hello January. Standing around in the orchard pruning the trees again. This year we've not had much of the wonderful crunchy frost and bright sunlight, it's either been squelchy mud and rain, or snow. Neither of which are much fun, to be honest. I have to admit it, I envy people with traditional cider orchards featuring huge unpruned trees. They can stay indoors at this time of year, or watch over their fermenting juice. 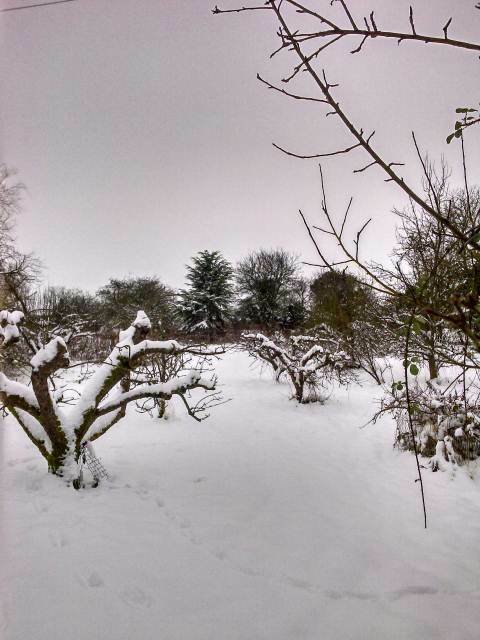 Our orchard was laid out for producing fruit to be eaten, so all its trees have been pruned to an artificial shape and need regular maintenance. We cider makers don't care in the same way about the size or visual quality of our fruit, so it's mildly annoying to have to spend so much time in the cold. The 2012 fermentation has slowed right down, I'll be thinking about racking it in a few weeks. Meanwhile the 2011 cider has turned out rather well. My unexpectedly cloudy batch I wrote about in the summer is slowly beginning to settle too, I was expecting it to take longer. As an experiment I've put some of it in an outbuilding where it'll be frosted to see whether that helps. 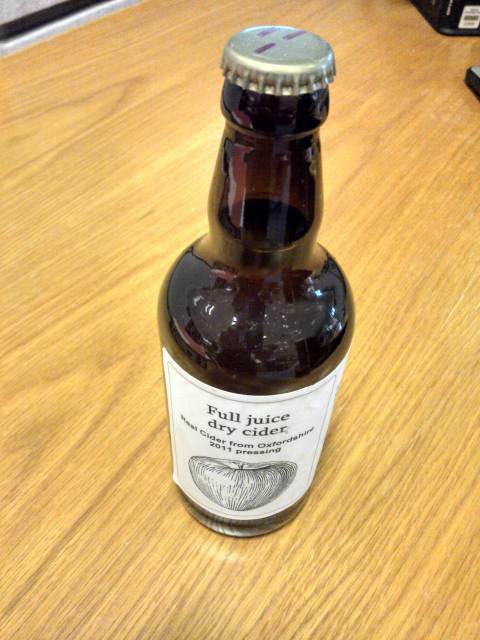 Meanwhile as usual I gave cider to my colleagues in lieu of Christmas cards. Now the label is adorned with a line drawing of an apple, courtesy of Wikipedia. I suspect I'll have to locate some little stubby bottles for next year if I want to give it out then, so poor was the 2012 harvest. Otherwise, everything's quiet until May, blossom time. Here's hoping for a better spring than last year.